Jessica Eguia and the students of Manoah Steves Elementary School listen with rapt attention as educational advisor to the Richmond School District and an Anishinaabe teacher, Lynn Wainwright, guides them through Indigenous children’s experiences of Residential School, sharing her vision for a better future through education and understanding. Officially, Orange Shirt Day in Canada is Sept. 30 every year. Because it falls on a Sunday this year, schools are observing this day of learning and reflection early. The day commemorates all the children in Canada forcibly removed from their homes, families, communities and cultures. Schools throughout Richmond observed Orange Shirt Day with a variety of projects and assemblies. 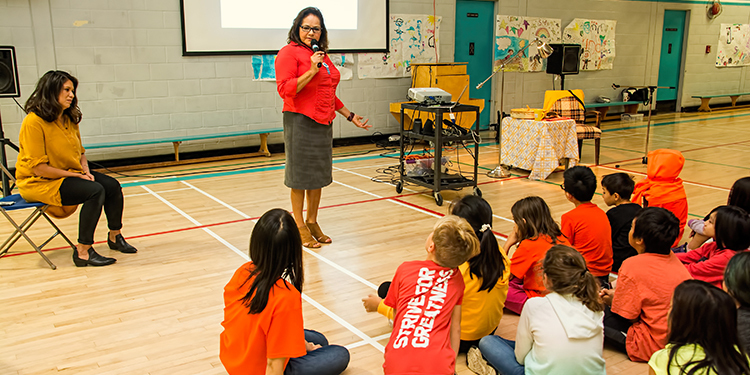 Manoah Steves Elementary in Steveston observed Orange Shirt day on Thursday, Sept 27 with a special assembly facilitated by Lynn Wainwright, an Anishinaabe educational advisor to the Richmond School District. Billing herself Wainwright’s able assistant for all things audiovisual, Jessica Eguia from Peru’s Apurimac region in the Andes brought grace and tech ability to the morning. Acknowledging the school sits on the traditional, unceded territory ofthe Musqueam, Wainwright continued, showing, telling and asking the children about the impact of residential schools on Indigenous children, families and communities. Talking about the disconnect from culture and parents that has such long tentacles, reaching through generations, she spoke of generations of children raised away from their parents who loved them, their grandparents who cherished them and their communities who missed them. A teacher for 25 years, Wainwright pointed out that parents who resisted the government’s seizure of their children were jailed. It was the law. She spoke of the disconnection from their roots that continues. When Wainwright mentioned that she didn’t learn her Anishinaabe name until she was an adult, there was a gasp from one of the students. Wainwright spoke of what residential schools have cost her family; her grandmother, her mother and her oldest sister who were taken from their families and incarcerated in a residential school. Many in these schools were underfed and brutalized. Those leaving in their mid-teens usually only had the equivalent of a Grade 3 education which left them with no marketable skills and poor job prospects. They didn’t know their families, their language or their traditions. Her family lived with the consequences of generations of parents who had been robbed of a childhood home-life. According to David Sadler, spokesperson for the Richmond School District, “Orange Shirt Day was created during the St. Joseph Mission Residential School Commemoration Project in Williams Lake, BC, in May 2013. As part of the project, former student, Phyllis (Jack) Webstad, told the story of her first day at Residential School when her shiny new orange shirt, bought by her grandmother, was taken from her as a six-year old girl.” Webstad never saw the shirt again.­­­ Everything she had was taken from her that first day of school. Today, all children and adults wear an orange shirt to recognize the loss endured by all the children stolen away by the government. The bright shirts also recognize the strength and resilience of residential school survivors. Over at Hugh Boyd Secondary, the students learned of Residential Schools’ impact in a variety of ways. “There has been strong staff and student buy in with the purchasing of many orange shirts, as well as a wide range of creative school initiatives,” says teacher, Michael Taylor. Boyd activities organized by their Social Justice 11/12 class included, orange sticky notes placed on every 25th locker in acknowledgement of the statistic that at least one in every 25 Indigenous students died at residential school, never to see their families again. There were also large orange shirt silhouettes displayed in Boyd’s main lounge where students from Social Studies classes could write and post messages for Residential School survivors. The student body all received orange ribbons to wear and the daily announcements featured a fact a day throughout the week-long awareness campaign. The students sat rapt—watching, hearing and feeling.